The Zuni Native American Indian reservation is located 32 miles southwest of Gallup, N.M. They have been known for making Needlepoint (tiny needle shaped stones), Pettipoint (tiny round, oval or square stones) and Turquoise Inlaid Jewelry for since the early 20th century. The Zuni Inlay Jewelry, Zuni Needle Point Jewelry, Zuni Petti Point Jewelry being made today is some of the most popular southwestern silver jewelry of the times. The Zuni Indians focus on stone cutting, they make simplistic silver pieces to accommodate their fabulous stonework. Rings, Bracelets, Earrings, Pendants and Necklaces are made with fine and delicate Turquoise and other Gemstones set in artistic designs in Zuni Inlay Jewelry, Zuni Needle Point Jewelry, Zuni Petti Point Jewelry. This New Mexico pueblo Indian tribe is very traditional and religious, which is reflected in their art. The Zuni people have been skilled lapidary artisans since ancient times. These stone lapidary skills, which had developed over the years, were easily applied to the creation of ornamental jewelry. With the incorporation of an expertise in silversmithing, the Zuni have taken the art of stone decorative jewelry to another level. Talented Zuni jewelry makers are most well known for their complexity inlay channel designs, fine turquoise petitpoint and hand carved fetish jewelry. They have developed a unique look which can be easily spotted by collectors and jewelry connoisseurs alike. The pueblo of Zuni Native American Indians is located in western New Mexico (south of Gallup) near the Arizona border. Jewelry-making is the major craft industry of the village. Like other Pueblo peoples, Zuni Indian artisans possess a true talent for lapidary work. In the last quarter of the nineteenth century, many Zuni Indian craftspeople learned silversmithing as well. Evidence points to Lanyade as the first Zuni Indian to learn to work Silver, sometime around 1872. He instructed other village men, and later raveled to Hopi Indian where he taught their first smiths. The number of Zuni Indian men and women engaged in silversmithing and lapidary work steadily increased as the twentieth century progressed. There is documentation to support the belief that one silversmith, Keneshde, was the first Zuni Indian to set turquoise on a piece of silver jewelry around 1890. However, early Zuni Indian jewelry-making efforts often took the form of collaborations between Navajos and Zuni Indians, in which a Navajo smith would cast a silver piece-by sandcasting or another method-and a Zuni Indian lapidarist would set in the stones. Zuni Indian was also the site of much Indian trader. The best documented of these individuals was C.G. Wallace, who stimulated sales and new directions for Zuni Indian jewelry. visiting ethnographers and recorders of life in Zuni Indian Pueblo. 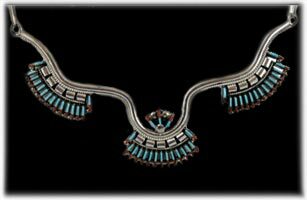 The Zuni Indians started Inlaid Turquoise Jewelry in the early 1900’s, we call this type of Inlay “Channel Inlay”. Zuni Channel Inlay is rare, highly sought after and valuable. This type of Zuni Inlay jewelry looks beautiful with any outfit and look great in a vintage Native American jewelry display. 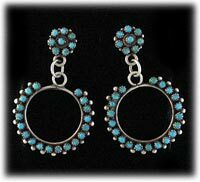 As years went by The Zuni Indians perfected their silver work and started making world class Inlaid Turquoise Jewelry. 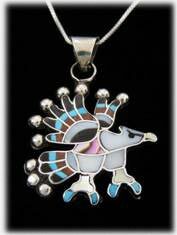 Today Zuni Inlay Jewelry is some of the most popular silver jewelry world wide. The Zuni’s love colored stones and shells and started mixing colored stones with Turquoise approximately 1920. Today's artists use all kinds of gemstones in their Zuni Inlay Jewelry. A beautiful Inlaid Zuni Indian bracelet by Dennis Edaakie. Dennis is famous for his flat pictorial multi-colored Inlay work. He makes Bracelets, Earrings, Pendants, Necklaces and more in his flat inlay. 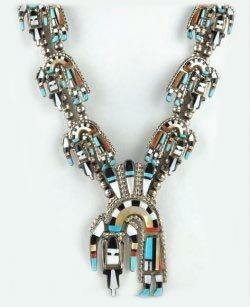 What a great example of Zuni Inlay Jewelry. Dennis Edaakie pieces are desirable and collectible as well. The Edaakie family is well known in the Native American art community. Their Zuni Inlay Jewelry is some of the finest. A wonderful Rainbow Man necklace made by Oscar Cellicion, Zuni Native American Indian. Oscar's pieces are considered some of the finest of Zuni inlay work. The necklace has eleven Rainbow Man Kachinas, a Zuni symbol for the supreme kachina of harmony which is a sign of the Great Mystery that gives man the privilege of walking this earth. Oscar’s sterling silver and lapidary work are fabulous and very well laid out. Oscar used Turquoise, Black Jet, both white and gold Mother of Pearl shell and Mediterranean Coral. When viewing the outstanding inlay work in this necklace you can easily understand why the world is so in love with Zuni Inlay Jewelry. This Beautiful Zuni Inlay Bracelet was made with Turquoise, Coral, Jet Mother of Pearl and Yellow Shell. Don & Viola are both Zuni Indians and are highly respected Jewelers and gemstone cutters! This Inlaid Bracelet is a classic example of their work and of Zuni Inlay Jewelry. This is a beautiful multi-colored Zuni Inlay Jewelry style Yei pendant made by Fadrian and Vivica Bowannie. They are both Zuni Native American Indian Jewelers and Gemstone Cutters from the Pueblo of Zuni and are proflic creators of Zuni Inlay jewelry. This Zuni Inlay jewelry style pendant is made with Turquoise, Pink Mussel Shell, Coral, Jet and Yellow Shell. Fadrian and Vivica are both well known Zuni Artists that make some of the most beautiful Inlaid Jewelry coming out of Zuni. Zuni inlay jewelry style Eagle Pendant by Chardette Dishta, Zuni Native American Indian Artists. The stones include in this example of Zuni inlay jewelry are Abalone, Mother of Pearl, Jet, Coral, Turquoise, and Gold Lip Mother of Pearl. Chardette has a different flair to her work which makes it have a contemporary look. 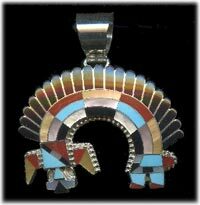 Zuni Inlay Jewelry is famous for its characters such as this inlay eagle pendant, Mickey Mouse Inlay Jewelry, Donald Duck Inlaid Jewelry and more. 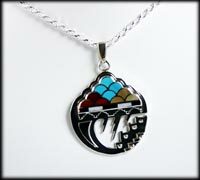 This beautiful Storm Design Zuni inlay jewelry style pendant was made by Ferdinand Hooee. The Zuni inlay jewelry style pendant is inlaid in multi color with Turquoise, Coral, Mother of Pearl and Jet. Zuni artists often like to create works of art that focus on a story or a character. Ferdinand does the silverwork in his Zuni inlay jewelry pieces and his wife, Sylvia, does the inlay work. The Hooee’s doe fine work and are well known for exquisite work and quality Zuni inlay jewelry pieces. In recent years, the Zuni Indians have refined Inlaid Turquoise Jewelry as well as Inlaid Multi-colored Gemstone Jewelry to a state of art. They make exquisite rings, pendants, necklace sets, earrings, bracelets and more. Zuni Jewelry is admired throughout the world for its intricacy and beauty. 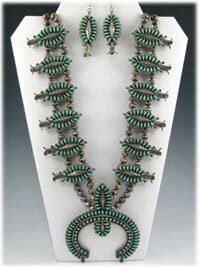 Zuni inlay jewelry is an exceptional value and a great collector’s item into the future. The Zuni Indians are known to be exceptional Lapidary craftsmen. They started cutting Turquoise into needle shaped stones about 1930 and making Zuni Needlepoint Jewelry. Sterling silver and gemstone Zuni needlepoint jewelry is still very popular today. Typically, the artsists group many stones in a pattern to create a very attractive ring, pendant, earrings and so on. Zuni needlepoint jewelry is delicate Jewelry and is not recommended for men, it is precious and is a wonderful choice for a modern day woman. This is a beautiful Zuni Needlepoint Jewelry style necklace made by Edmund Cooeyate. Notice how Edmund laminated Coral and Turquoise together and then cut them into Needlepoint stones.This is a wonderful example of classic Zuni Needlepoint Jewelry with a modern twist. You can clearly see how different in style Zuni Needlepoint Jewelry and Inlay Zuni Jewelry is. One thing you will notice is that the Zuni Native American artists favor the color combonation of Turquoise, Coral and Mother of Pearl. The Zuni Silversmiths make jewelry in all diffferent colors, but traditionally they make Turquoise Jewelry, Coral Jewelry and Morther of Pearl Jewelry. In most cases, Zuni needlepoint jewelry is a single color or gemstone. You can really see how much time could go into making a work of art such as this wondeful Needle Point Necklace. This is a colorful Zuni Needlepoint Necklace and a credit to Edmund Cooeyate! This is a classic Turquoise Zuni Needlepoint jewelry style necklace and earrings Set by Bryant Waatsa, Jr. Look at the detail in the stone work and intricate bezel work. The needlepoint Turquoise stones almost look like little blue porquepine quils. Each piece of this necklace will take hours of tedious work to complete. Zuni artists are known for their attention to detail. Most of the Zuni Needlepoint Jewelry is light and easy to wear. Bryant is a Zuni Native American Indian Jeweler, his specialty is Zuni Needlepoint Jewelry with a focus on Needlepoint necklace sets, pendants, earrings and more. This Turquoise Zuni Needlepoint Jewelry style pin/pendant was made by V.S. Johnson, a Zuni Native American Indian Jeweler and Artist. Each sliver and Needlepoint Turquoise Stone is set in a silver bezel – this is very time consuming and tedious work. 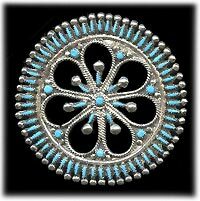 The beautiful pin looks to be modeled after a daisy or some other sort of flower, but the silverwork that accompanies the Zuni needlepoint jewelry style stone work is also reminiscent of a snowflake design. This beautiful Turquoise Zuni Needlepoint Jewelry style bracelet and Ring set was made by Libert and Carol Peyketewa who are both Zuni Indians. Libert and Carol make a variety of Zuni Needlepoint Jewelry items such as Rings, Earrings, Pins, Pendants and Bracelets. 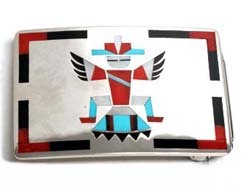 Their work is classic Zuni design and collectors quality. Pettipoint Jewelry began around 1930 and was a creation solely by the Zuni Indians. A Pettipoint stone is a tiny round, oval or square stones. The tiny stones are clustered in multiples to form a unique design, often a ring may have 12 or more stones, a bracelet 50 -80 stones and so on. Zuni Pettipoint Jewelry is very unique in the world and is special Jewelry that is impressive wearable art. They make Pettipoint Rings, Earrings, Bracelets, Pendants, Necklace Sets and more. The necklace to the right is a beautiful example of a Zuni Turquoise Petit Point Squash Blossom Necklace. This one was made about 1940 and is a work of art. Zuni Petti Point or Petit Point Squash Blossom necklaces have been a major part of the Zuni Native American Indian's ceremonial wardrobe for many, many years. This Petti Point Squash blossom represents many, many hours of tedious work and great vision. Try to count how many stones are in this work of art. This beautiful Zuni Petit Point jewelry style bracelet was made by Arvina Pinto. It is considered a cluster bracelet as the Turquoise Stones are set in a clustered arrangement. The center of the bracelet represents a flower. This is a great example of a classic Zuni Petti Point jewelry style. This is a very unique piece that was created by a talented Zuni Petti Point jewelry artist, Arvina Pinto. Work of this quality is rare and highly collectible, especially in Zuni Petti Point jewelry style. The earrings to the right are a classic style of Zuni Petti Point jewelry style Turquoise Earrings made by many Zuni Native American Indians on a regular basis. Zuni Petti Point jewelry style earrings are one of the staples in Southwestern Native American Indian Jewelry. Zuni Petit Point jewelry style earrings are light weight and easy to wear for women as well as being very attractive to all. The Zuni Petti Point jewelry style earrings to the right are still very in fashion today! This is a unique style of Zuni Petit Point jewelry style earrings in a Snowflake design.The Zuni Indians are very artistic and have made some of the finest Turquoise Earrings in the history of Southwestern Native American Indian Jewelry. Along with fantastic design, Zuni Petit Point jewelry earrings are lightweight which makes them easy to wear while being beautiful at the same time. 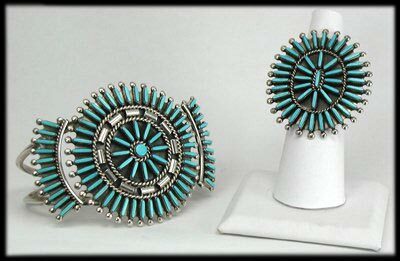 Antique Zuni Indian Jewelry is highly prized by collectors of Vintage Indian art. 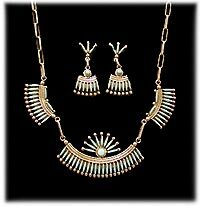 Classic Zuni Jewelry designs of the past are awesome and superbly visual. They made a lot of great pins in the olden days with wonderful designs and they were masters at beautiful earrings that are still in vogue and beyond attractive. Vintage Indian Jewelry made by the Zuni Indians is very special and an honor for anyone to own. John and Estell Hartman of Durango Silver Company have been collectors of Vintage Indian Jewelry since the early 1970’s and often let items go from their collection. We continuously look for old Zuni Inlay Jewelry, Zuni Needle Point Jewelry, Zuni Petti Point Jewelry and as we find nice pieces we will put them up in our online store for your pleasure. Thank you for reading our page about Zuni Inlay Jewelry, Zuni Needle Point Jewelry, Zuni Petti Point Jewelry and we hope that you have learned some helpful information about Zuni Inlay Jewelry, Zuni Needle Point Jewelry, Zuni Petti Point Jewelry.